Earn passive income. Trade Forex, Shares, Commodities, Bond & Indices. The Forex Currency pair Pound dollar (GBP/USD) is trading in a very tight range for the last 20 days. 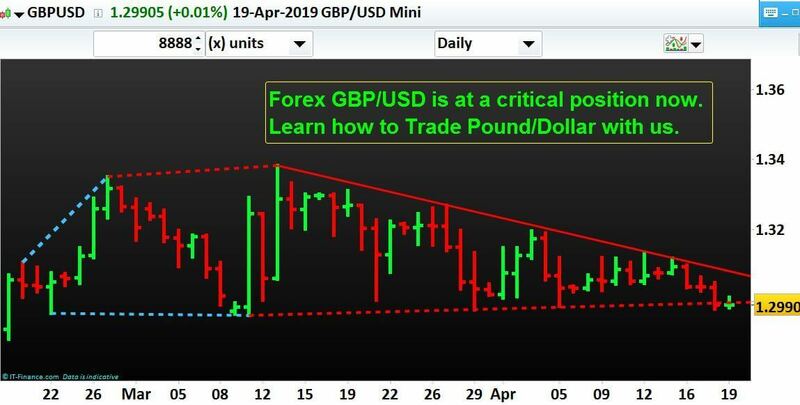 In this post, we have highlighted the extreme power of a possible breakout (or bounce) trade from this critical Market Structure printed by the Forex Currency pair GBP/USD also known as Sterling Dollar or Pound Dollar or Cable. We will illustrate how the Pound Dollar (GBP/USD) needs to be Traded from here? At the time of writing this blog post, Pound Dollar has printed a typical Forex Pattern as explained below. Forex Pair Pound Dollar is at the end of the pattern now. Time has come for Pound Dollar to break the bottom support line or bounce from there. The last support line for Pound Dollar was drawn by joining the swing lows of 11.03.2019 and 29.03.2019 which supported the price on 05.04.2019 to the dot. The last resistance line for Pound Dollar was drawn by joining the swing highs of 13.03.2019 and 27.03.2019 which resisted the price recently on 12.04.2019 to the dot. The last support line is a tentative trend line for obvious reasons (as explained in the N P Financials’ Trader Foundation course) for Pound Dollar. We need to see a confirmed break (as defined by N P Financials’ Breakout method) of the support line in the coming few days to consider Short positions for Pound Dollar. To know these critical aspects of this predictable pattern breakout by taking your Forex Trading to the Next Level through all our professional approach please contact us at 03 9015 4858 and book your FREE Trading session for 30 minutes at Level 3, 2 Brandon Park Drive, Wheelers Hill, Victoria 3150. Now you can learn to trade Forex Pairs with us to explore the possibility of earning passive income keeping your day job. Our Proprietary Forex Trading Strategy which work will guide you through every step of your trading in Forex Pairs and explore the possibility of earning extra income. Learn what all other Forex Currency Pairs we are Trading in our Forex Trading Asset Class. Develop yourself as a professional trader capable of capturing second income in the future with us. Bitcoin has moved Up a humongous 1,272 points after our Blog post dated 31.03.2019. This huge move up for Bitcoin happened in just 6 days after our Blog post. This tremendous move up is equal to a jump of 31.22% in the price of only one Cryptocurrency out of 4 we posted on 31.03.2019 viz. Bitcoin. All 4 coins put together, the move is an astronomical 149.37% in last 6 days. In this post, we will be highlighting the status of the individual Cryptocurrency one at a time. We will show you our viewpoint of the Cryptocurrency market as a whole. We will demonstrate the relationship/ correlation between the Cryptocurrency family members. The chart below shows the relationship/ correlation between Cryptocurrency family members in a daily time frame for the last 26 months. Now let us discuss the first Cryptocurrency viz Litecoin: Litecoin started its trading journey when this Cryptocurrency was at the level of 3.0 in the month of October 2013. This Cryptocurrency traded down at 1.1 level in the month of Jan 2015. From there it went up to 446.2 in the month of Jun 2015. Recently the high for this Cryptocurrency was 258.7 in the month of Jan 2018 and a recent low of 22.3 in the month of Dec 2018. Now it is trading at 61.0 at the time of writing this post. Second Cryptocurrency viz Ether started its trading journey when this Cryptocurrency was at the level of 0.70 in the month of August 2015. This Cryptocurrency traded down at 0.4 level in the month of Oct 2015. From there it went up to 1,381.5 in the month of Jan 2018. Recently the low for this Cryptocurrency was 81.4 in the month of Dec 2018. Now it is trading at 140.5 at the time of writing this post. The third Cryptocurrency viz Ripple started its trading journey when this Cryptocurrency was at the level of 0.017 in the month of Jan 2015. This Cryptocurrency traded down at 0.004 level in the month of Jan 2016. From there it went up to 3.055 in the month of Jan 2018. Recently the low for this Cryptocurrency was 0.247 in the month of Aug 2018. Now it is trading at 0.306 at the time of writing this post. The last Cryptocurrency viz Bitcoin started its trading journey when this Cryptocurrency was at the level of 1.0 in the month of Jan 2011. From there it went up to 19,201 in the month of Dec 2017. Recently the low for this Cryptocurrency was 3,136 in the month of Dec 2018. Now it is trading at 4,074 at the time of writing this post. In the chart above from the relationship/ correlation between the Cryptocurrency family members, we can see that the best performing Cryptocurrency is Ether, then Ripple, then Litecoin followed by Bitcoin as of now. To know how to take advantage of our proprietary correlation between the Cryptocurrency family members, please join our Cryptocurrency trading desk. Now you can learn how to trade all the Cryptocurrency family members with us to explore the possibility of earning passive income keeping your day job. Our Proprietary Cryptocurrency Trading Strategy will guide you through every step of your trading in Cryptocurrency family members and explore the possibility of earning extra income. Learn what all other Cryptocurrency Pairs we are Trading in our Cryptocurrency Trading Asset Class. Develop yourself as a professional trader capable of capturing second income in the future with us. Commodity- Rough Rice is now breaking out of a critical Head & Shoulder (H&S) Pattern. In this post, we will be highlighting how you can participate in the existing opportunity from Commodity- Rough Rice and get benefited financially. We are using the weekly chart for our technical analysis for Commodity- Rough Rice. Recently Commodity- Rough Rice has consolidated near the big whole number of 10,000 price points in the last 6 months as shown in the chart. The recent swing low for Commodity- Rough Rice printed by price was at 9,869 in the week ending 22nd of Feb 2019 (week number 08). This is the right shoulder of the existing Head & Shoulder Pattern in the discussion. To the left of this swing low, the head was printed by price on 21st of Sep 2018 (week number 38) at the price level of 9,683. Commodity- Rough Rice has the left shoulder of the existing head and shoulder on 4th of Jun 2018 at the swing low price level of 10,596.
swing high between the left shoulder and the head, This swing high was found at the price level of 12,113 on the week ending 13th of Jul 2018.
swing high between the right shoulder and the head, This swing high was found at the price level of 11,162 on the week ending 7th of Dec 2018. Is the price going to take out the high of last week’s and print a higher high with an up bar this week? Is Commodity- Rough Rice going to perform a “Crack & Snapback” as per the technical analysis we teach in our best Commodity Trading course or continue to go up? How are going to trade Commodity- Rough Rice from here so that you can capture the big move and convert it to real money, remembering 100 points move in your favour can generate $100 if you have traded $1 a point? How our clients are tradingCommodity- Rough Rice from here? What is the price target of Commodity- Rough Rice from here? Take this big opportunity to learn how to trade Commodity- Rough Rice with us to explore the possibility of earning passive income keeping your day job. Commodity Trading can provide big opportunities if traded at the right time in the right direction. Our Proprietary Commodity Trading will guide you on every step of your trading in a commodity like Rough Rice. Start exploring the possibility of earning extra income. Learn what all other Trading Strategies we are adopting to Trade in our Commodity Trading. Develop yourself as a professional Commodity Trader capable of capturing extra income in the future with us. To know how to capture these big opportunities in your Trading, please Book Your 30 Minutes FREE Session With Us at Level 3, 2 Brandon Park Drive, Wheelers Hill, Victoria 3150 or just Call us. Catch the tremendous opportunity from commodity Soybean Meal Trading. In this post, we will be highlighting how you can participate in the tremendous opportunity from commodity Soybean Meal Trading and get benefited financially. We are using the weekly chart for our technical analysis for Soybean Meal. Commodity Soybean Meal is actually trying to form a base from the swing low of 30,270 printed in the week ending 31st of August 2018 (week number 35). After that commodity Soybean Meal printed a slightly lower low at 30,200 in the week ending 21st of September 2018 (week number 38). This low of week number 38 was well supported by the support line drawn by joining the swing low of 31,029 printed in the week ending 12th of January 2018 (week number 03) and the swing low of 30,270 printed in the week ending 31st of August 2018 (week number 35) as shown in the chart. 30,206 on week number 09 ending on 1st of March 2019 just 2 weeks before. Is this low going to be a swing low in this week? Is Commodity Soybean Meal going to perform a “Crack & Snapback” as per our technical analysis we teach in our best Commodity Trading course? How are going to trade Commodity Soybean Meal from here so that you can capture the big move and convert it to real money, remembering 100 points move in your favour can generate $100 if you have traded $1 a point? How our clients are trading Commodity Soybean Meal from here? Take this big opportunity to learn how to trade Commodity Soybean Meal with us to explore the possibility of earning passive income keeping your day job. Commodity Trading can provide big opportunities if traded at the right time in the right direction. Our Proprietary Commodity Trading will guide you on every step of your trading in a commodity like Soybean Meal. Start exploring the possibility of earning extra income. Learn what all other Trading Strategies we are adopting to Trade in our Commodity Trading. Develop yourself as a professional Commodity Trader capable of capturing extra income in the future with us. Learn how to Trade China 50 Index from here. For those of you who are wondering what is China A50index, below is its definition from Wikipedia: FTSE China A50 Index (was known as FTSE–Xinhua China A50 Index) is a stock market index , the components were chosen from Shanghai Stock Exchange and Shenzhen Stock Exchange. 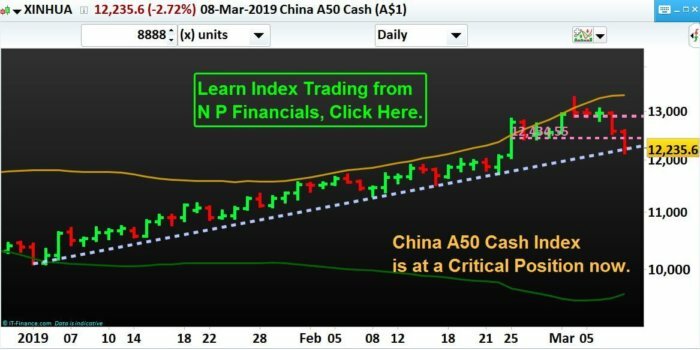 Those of you who are index traders, China A50 index is now in a critical position as far as Technical Trading is concerned. China A50 index closed at 12,235.6 on last Friday which is just above the trend line drawn from swing low dated 02-Jan-2019 to swing low dated 08-Feb-2019. Price is coming down after printing a swing high of 13,305.8 on Monday 04-Mar-2019. Price has closed below the mid-point of the big bar dated 25-Feb-2019. Is this a Buy opportunity in Pullback in Up Trend? What should happen for China A50 index to start a correction or a Down Trend? What should happen if China A50 index closes below the trendline? After China A50 index closes below the trendline, what MUST happen technically to initiate a Short Trade? What should happen if China A50 index closes above the trendline? After China A50 index closes above the trendline, what MUST happen technically to initiate a Long Trade? We will train you to explore the Possibility Of Earning Passive Income keeping your day job. Start exploring the possibility of earning extra income. Learn what all other ADVANCE Trading Strategies we are Adopting To Trade. Develop yourself as a Professional Trader capable of capturing extra income in the future with us. Know how to capture the big opportunities in your Trading. at Level 3, 2 Brandon Park Drive, Wheelers Hill, Victoria 3150. The Real Power of advance MACD from N P Financials. Know how to use advance MACD to get its Real Power. In this blog post, we will show you the most advance way of how to correctly use the powerful MACD indicator to get all the benefits from it. Let us first define MACD for you. MACD stands for Moving Average Convergence/ Divergence. There are 4 basic elements of MACD as an indicator as below. We will define the standard (12,26,9) MACD here. The blue line (MACD line) represents the difference between 12 and 26-period exponential moving averages. The red line (Signal line) represents the 9-period exponential moving average of the blue line. The histograms show the difference between the blue and red lines. The black/white line is the centre line or “0” (zero) line. Basic elements of MACD as an indicator. To identify and trade Divergence after the market becomes Over-Bought or Over-Sold (Advance Use). Multiple Time Frames MACD Confluence can also be used to derive benefits from MACD. Zero line Reversal and Hook Trading from MACD. At N P Financials, we will show you the other powerful features of MACD, e.g. How to maximise Rewards with minimum Risks with our Hooks and CLR Trades. Watch out Natural Gas and NY Orange Juice for Trading Opportunities. 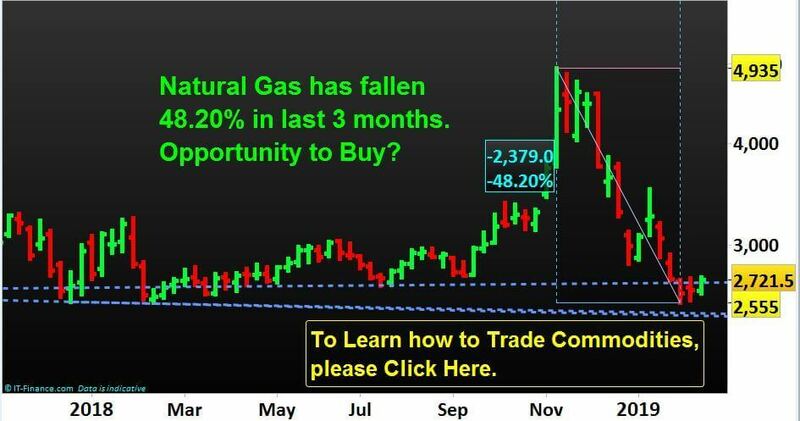 Do you know, Natural Gas has fallen almost 50% (exact 48.20%) in value in the last 3 months? Let us assess the situation whether there is an Opportunity to Buy? Do you know, NY Orange Juice has fallen almost 50% (exact 49.54%) in value in the last 2 years? Let us assess the situation whether there is an Opportunity to Buy? In this post, we have discussed our proprietary concept of how to watch out Natural Gas and NY Orange Juice for Trading Opportunities. The chart below is a weekly chart of Natural Gas. Natural Gas printed the high price of 4,935 on 14.11.2018. From this price, Natural Gas has fallen almost 50% (exact 48.20%) in value in the last 3 months. It has recently printed the low price of 2,556.5 on 07.02.2019 only a couple of weeks ago as shown in the chart below. Now it seems, Natural Gas has got support in our zone of demand from 2,555 to 2,581 as highlighted in the chart below. Next chart below is a weekly chart of NY Orange Juice. NY Orange Juice printed the high price of 22,782 on 02.11.2016. From this price, NY Orange Juice has fallen almost 50% (exact 49.54%) in value in the last 2 years. It has recently printed the low price of 11,497 on 15.02.2019 only a week ago as shown in the chart below. 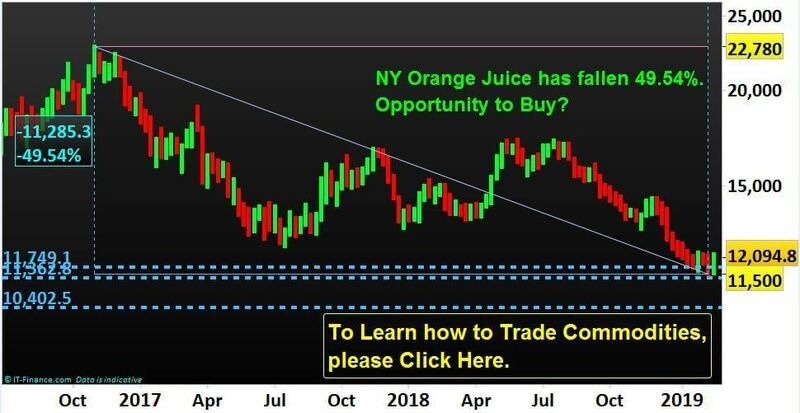 Now it seems, NY Orange Juice has got support in our zone of demand from 11,362 to 11,749 as highlighted in the chart below. Take this big opportunity to learn how to trade NY Orange Juice and Natural Gas with us to explore the possibility of earning passive income keeping your day job. Commodity Trading can provide big opportunities if traded at the right time in the right direction. Our Proprietary Commodity Trading will guide you on every step of your trading in a commodity like NY Orange Juice and Natural Gas. Start exploring the possibility of earning extra income. Learn what all other Trading Strategies we are adopting to Trade in our Commodity Trading. Develop yourself as a professional Commodity Trader capable of capturing extra income in the future with us. To know how to capture these big opportunities in your Trading, please book your 30 minutes FREE session with us at Level 3, 2 Brandon Park Drive, Wheelers Hill, Victoria 3150. 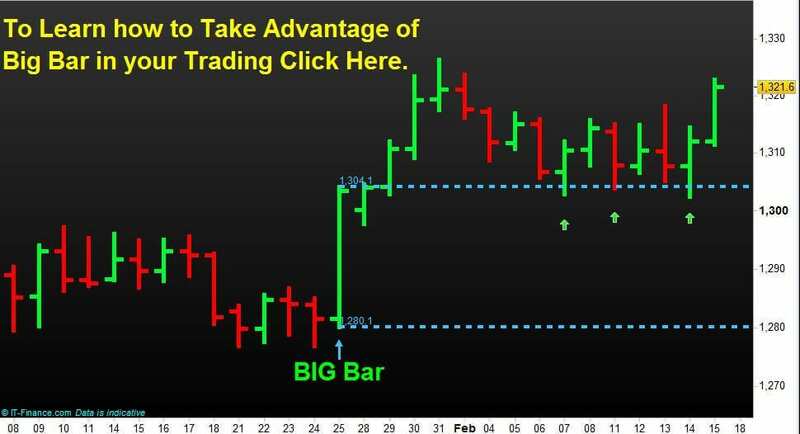 Take Advantage of Big Bar in your Trading. Do you know, Big bars can present a tremendous opportunity in Trading? 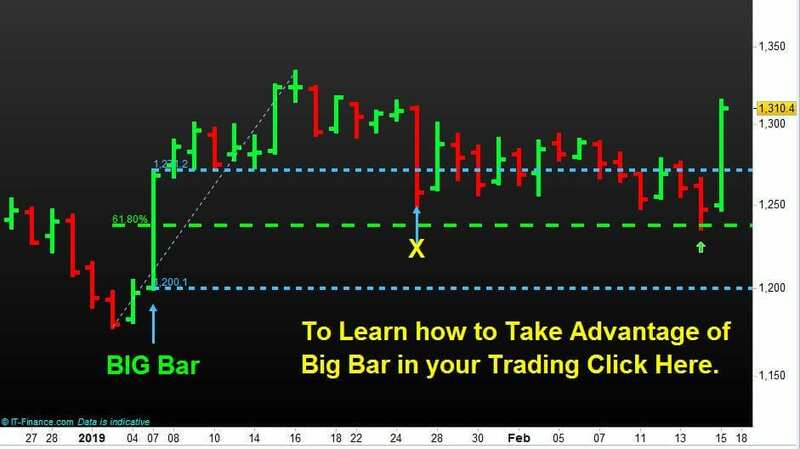 Do you know how to take Advantage of Big Bar in your Trading? In this post, we have discussed our proprietary concept of how to take Advantage of Big Bar in your Trading. 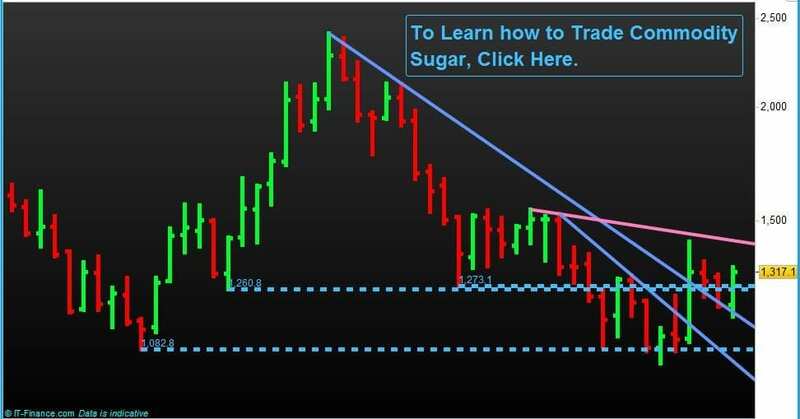 The chart below is a daily chart of commodity Sugar. Sugar price printed the Big Bar on Mon 07-Jan-2019. The low of the bar was 1200.1 and the high price on that day was 1271.2. That was a huge bar in comparison to previous bars. Sugar Price after the appearance of the Big Bar tried to re-test the high of the bar on Fri 25-Jan-2019. It could manage to penetrate the high price level and closed below the said level on that day. We should not jump on to buy Sugar on that day since the close was below the high price. Instead, we should wait till Thu 14-Feb-2019 when the price got bounced from the 61.8% Fibonacci level (drawn from 03.01.2019 to 16.01.2019). Next chart below is a daily chart of commodity Gold. Gold price printed the Big Bar on Fri 25-Jan-2019. The low of the bar was 1280.1 and the high price on that day was 1304.1. That was a huge bar in comparison to previous bars. Gold Price after the appearance of the Big Bar tried to re-test the high of the bar on Thu 07-Feb-2019. It could not manage to penetrate the high price level and closed above the said level on that day and also on following days viz. 11.02.2019 and 14.02.2019. Since it closed above the high price there were 3 distinct opportunities to trade Gold from those levels to the upside. Now you can also learn how to trade Big Bars efficiently with us to explore the possibility of earning passive income keeping your day job. Big Bars can be traded through our proprietary methodologies. Our Proprietary Big Bar Trading Strategy will guide you on every step of your trading in a commodity like Spot Gold and Sugar e.g. Start exploring the possibility of earning extra income. Learn what all other Big Bar Trading Strategies we are adopting to Trade in our Trading different Asset Classes. Develop yourself as a professional trader capable of capturing extra income in the future with us. To know how to take Advantage of Big Bar in your Trading, please book your 30 minutes FREE session with us at Level 3, 2 Brandon Park Drive, Wheelers Hill, Victoria 3150. 1,082.8 which was the swing low of August 2015. 1,260.8 which was the swing low of February 2016. 1,273.1 which was the swing low of June 2017. Trend line drawn from swing high of January 2018 to June 2018 as shown in the monthly chart above for Commodity Sugar. The last hurdle for Commodity Sugar to clear is the Trend line drawn from swing high of November 2017 to January 2018 (the pink line). It is important for Commodity Sugar to stay above our Support line of 1,273.1 for next 6 days till the end of this month of January 2019 for an upside potential. Now learn how to trade Sugar Market as a commodity with us to explore the possibility of earning passive income keeping your day job. Commodity Sugar can be traded through our Power of Scientific Method of Market Analysis as a derivative. Our Proprietary Commodity Trading Strategy will guide you through Our Power of Scientific Method of Market Analysis every step of your trading in a commodity like Sugar and explore the possibility of earning extra income. Learn what all other Commodities we are Trading in our Commodity Trading Asset Class. Develop yourself as a professional trader capable of capturing extra income in the future with us. Trade Commodity Sugar Market as a contract for difference through Our Power of Scientific Method of Market Analysis. In this post, we have helped you to take your Forex Trading to the Next Level through our professional approach on how to Trade EURO Dollar (EUR/USD) by having an eye on US Dollar Index (DX). 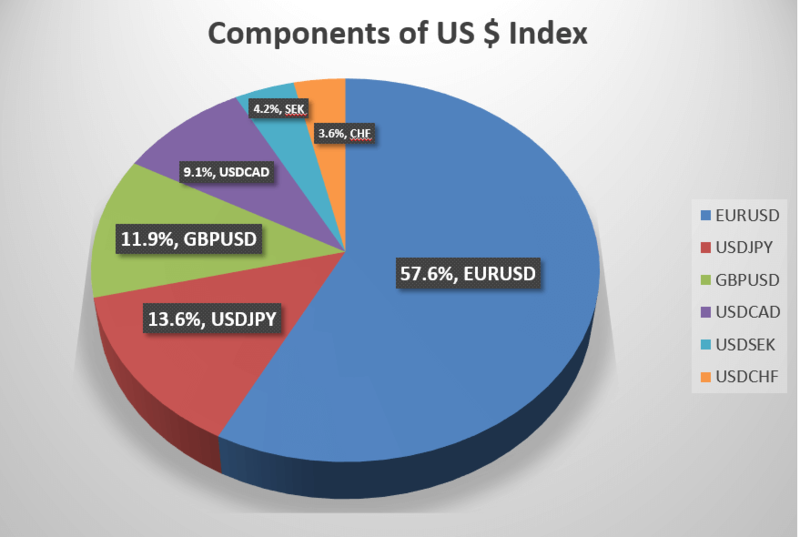 Let us first explain, what is US Dollar Index (DX). EUR/USD (Euro), USD/JPY (Yen), GBP/USD (Sterling), USD/CHF (Swissy), USD/CAD (Loonie) and USD/SEK (Swedish Krona against US Dollar). Now the question is how you can take your Forex Trading to the Next Level through our professional approach on how to Trade EURO Dollar (EUR/USD) by having an eye on US Dollar Index (DX). This is illustrated in the following two daily charts. 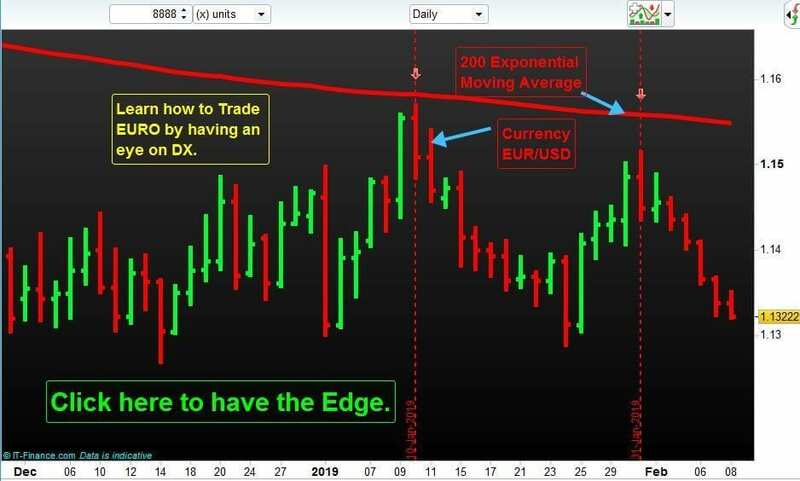 The first chart is for EUR/USD, in which we have plotted a 200-period exponential moving average (EMA) along with the price bars of EUR/USD currency pair as shown below. 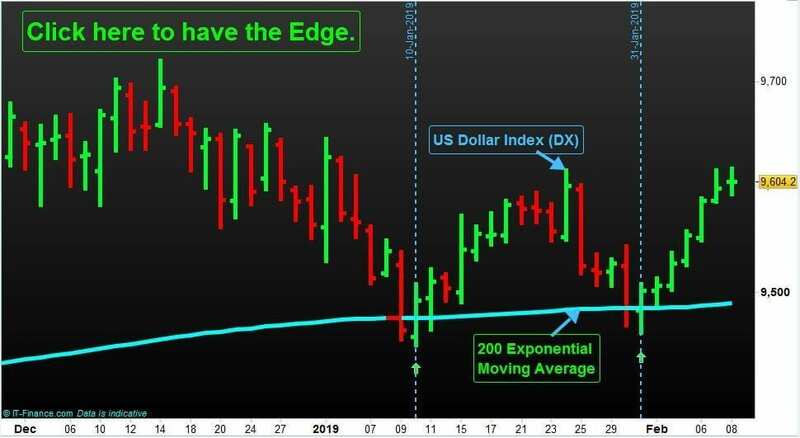 One way to consider bullish and bearish BIAS of a tradeable instrument is to observe whether the price is plotting above its 200-period exponential moving average or below its 200-period exponential moving average respectively. Once we have identified the BIAS then only one thing is left out to observe and trade the Bounce or Breakout of the tradeable instrument from its 200-period exponential moving average. EUR/USD and US Dollar Index, when put together, gave us the additional confirmation on how to take the 2 bounced trades for EUR/USD from the all-important 200 EMA on 10.01.2019 and 31.01.2019. Now you must be wondering how you can take your Forex Trading to the Next Level through all our professional approaches. To take your Forex Trading to the Next Level through all our professional approaches and to find out the answers to all your Trading related queries, please contact us at 03 9566 7275 and book your FREE discussion session for 30 minutes at Level 3, 2 Brandon Park Drive, Wheelers Hill, Victoria 3150.